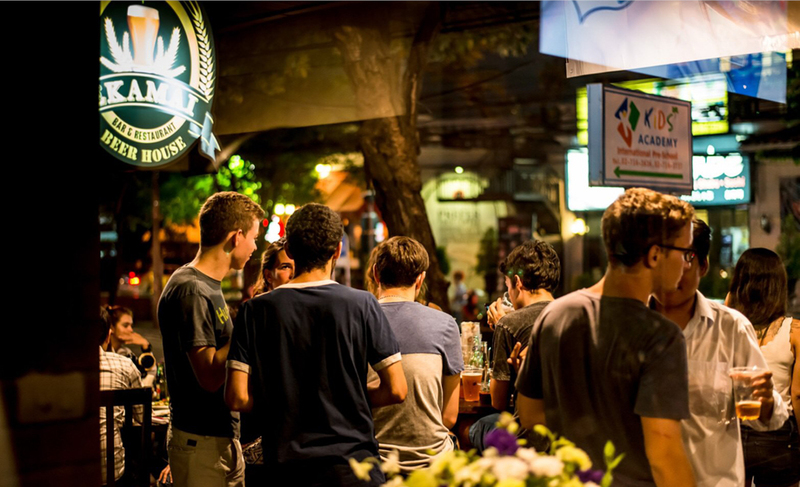 27 bars in Bangkok to drink beer. And only beer. There’s never been more choice and better quality brews in Bangkok. Here’s your best bet on where to find them. Probably 72 Courtyard's most easygoing opening sits at the complex's ground floor and boasts of a hefty 20 beers on tap, from Leo and Asahi to La Chouffe and L’Olmaia LA5. These are served alongside East-meets-West drinking snacks like pork wontons and barbecue ribs. There's bar seating and tables outside for when the weather's fine, while inside has larger spaces suitable for playing games like jenga, chess and even beer pong—all available on the house. The Commons now counts not one, but two counters devoted to niche craft beers, both on tap and by the bottle. The ground-floor original offers the biggest selection—expect the likes of BrewDog Punk IPA and Limburgse Witte—or you can also head upstairs where The Beer Cap mk. 2 serves nine rotating taps. Top marks go to the refreshing Bridge Road Beechy summer ale and the sweet-sour Duchesse De Bourgogne. The bustling bar-slash-restaurant offers some 100 labels, including the likes of Deschutes Chainbreaker and Rogue Hazelnut Brown Nectar on tap. Expect new brews to regularly appear on tap, like Ballast Point's Sculpin and Sculpin Grapefruit IPAs. The food side of things features classic pub grub like fried pork knuckle, braised pork orecchiette and laab moo tod (deep-fried minced pork with chilies and mint). 1/F, Portico, 31 Soi Lang Suan, 02-050-5158. Open daily 10.30am-1am. Located inside the Holiday Inn Hotel Chidlom, this vast, industrial warehouse-inspired venue serves both mass and craft beers plus Thai and European bar food. 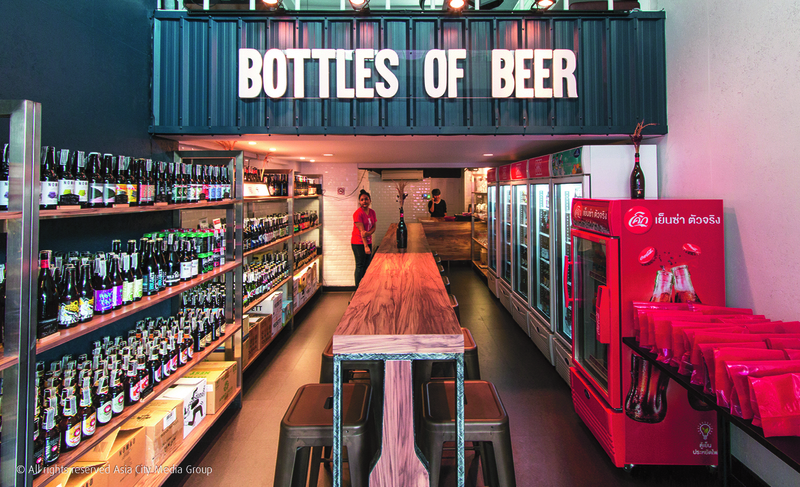 Aiming for both the after-work and heavy partying crowds, they stock over 70 labels of beer. Hungry? They offer both Thai and European comfort pub food, to go with nightly live music. Holiday Inn, 971 Phloen Chit Rd., 02-656-0080. Open daily 11am-midnight. This friendly bottle shop-slash-bar has one of the best craft beer selections in the city. What’s more, a big proportion of the bottles are from local breweries that you won’t find many places. Grab a slightly fruity Stone Head Koh Kong pale ale from the fridge and join the international crowd of regulars at the communal counter. Adjoining restaurant, The Meat Pan, whips out burgers and other meaty dishes. If you’re not down with the communal seating downstairs, there’s some private tables up on the mezzanine too. The Thonglor institution may have closed, but the Soi 11 follow-up is still going strong. Here, you can find some 300 imported bottles from familiar importers Beervana, Brewdog, Hopsession and more. To go with, you can't beat a Daniel Thaiger burger. This beer bar offers 30th-floor views of Sukhumvit. Along with a free and easy party atmosphere, Brewski offers an international selection of beers, with choices ranging from American craft beers to Belgian classics. There's also a decent selection of ciders (try the Zeffer Crisp Green Apple Cider from New Zealand) and Thai-style bar munchies like sai krok Isaan (Thai-style pork sausages with fresh chilli, ginger and peanuts). Craft beer enthusiast Ted Ahn pairs craft beer with Mexican-Korean fusion food at his restaurant-slash-bar, located right next to MRT Petchaburi. The second branch, above urban surf park Flow House, sticks more to burgers and pizzas to go with a drinks list showcasing Thailand’s burgeoning craft beer industry. Changwon Express’ pride and joy is their own brew, the Asoke Pale Ale; golden, hoppy and citrusy, it slips down nicely. 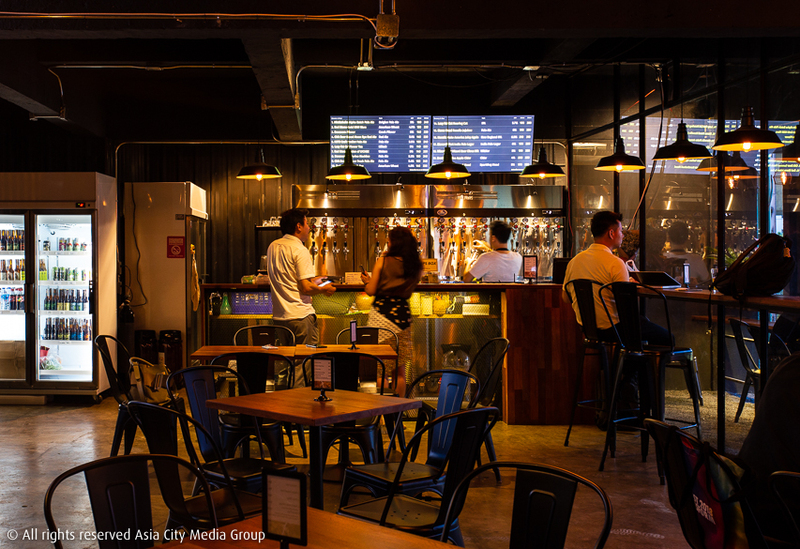 The semi-outdoor stall exclusively sells craft beers, with 20 labels on tap for Silom branch and over 40 beers on tap for Sukhumvit branch rotating monthly and 50 bottled varieties. Expect familiar names like Deschutes, Rogue and Anderson Valley, with a particular focus on hoppy, high-alcohol-content IPAs. One of our picks, The Anderson Valley Blood Orange Gose, is made from an ancient German recipe and has a unique salty-grapefruit like flavor. This bar taking over an 80-year-old, two-story house out the back of Phaya Thai not only boasts arguably the best selection of local craft brews this side of town, but also some excellent Thai food—to go with a few creepy claims that the house is haunted. Pick from an ever-rotating list of beers like Taopiphop Ale Project’s Hurtster Saison, Yodbeer’s Bearnana Wit and Outlaw Brewing’s Outlaw Mosaic IPA. Fiery food faves include leng (pork bone served with spicy soup) and sai yaang (grilled pig’s intestines) served with a tamarind-heavy jaew sauce. 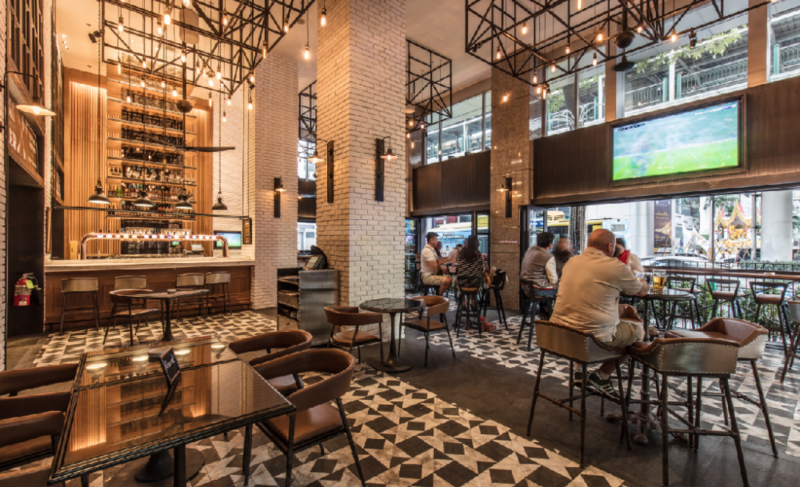 Set in a three-story rustic brick building, this beer house boasts 16 draft beers on tap alongside a wide selection of imported brews and international wine. Expect plenty of music on the first floor, where live bands perform every Mon, Wed and Fri nights, while the free jukebox takes over the rest of the time. The dining area on the second floor serves up Western and Thai classic dishes, plus roast lunches and dinners every weekend. Meanwhile, the third floor is a sports bar featuring a pool table, shuffle board and large TV screens showing all major sports games live. This basic, grungy space puts some serious gusto into its classic American dishes and also hosts comedy nights, gigs and movie screenings. Join the largely expat crowd and order the deep-fried jalapeno stuffed with Wisconsin cream cheese, Buffalo hot wings and Jack the Ripper (deep-fried bacon-wrapped sausage topped with peppers, onions and jalapeno cheese sauce). Reasonable prices and a rocking playlist earn it extra points. Also expect an America-centric craft beer list (from Melvin to Deschutes)—head there for "Thirsty Thursday" and B40 off 30+ beers. Local brewer Pipatnapon “Piek” Pumpo runs this six-tap craft beer bar that exclusively serves strains of Piek’s own Golden Coins beer. The bare-brick space in Ekamai Mall also dishes out some perfect drinking food: pulled pork burgers, fish and chips and pork knuckle. Piek launched Golden Coins back in 2011, making it one of Bangkok’s original craft beers. Unlike some of the expat beer bars around town, this one pulls in a big local crowd. Don’t let the haunted hospital vibe scare you off, because this place serves one of the best selections of imported craft beer in Bangkok. First opened in Ploen Chit back in 2015, they have now expanded to Phrom Phong, retaining the dark vibe that goes so nicely with bitter IPAs and ‘90s rock. 2/F, Mahatun Plaza, 888/26 Phloen Chit Rd. 02-650-7589. Open daily 5pm-midnight. 593/27 Sukhumvit Soi 33/1, 02-258-1461. Open daily 5pm-midnight. Bangkok’s very first beer-centric bar has branches all over town. Our favorite is probably on the second floor of the Rain Hill community mall on the corner of Sukhumvit Soi 47. With every outlet sporting its own unique concept, the HOBs here is decked out to have the look and feel of a train station. Expect all the classic beers on tap, with a few added bottles, including a number of craft beers. After a nearly-two year absence from the scene, one of Thailand’s pioneering craft beer bars was recently reborn with more beer, more food and all of the old charm. It’s also kept its unique name, taken from a Game of Thrones quote—“Kill the boy and let the man be born”—and meant to symbolize the bar's position operating on the fringes of legality.The man behind the beer menu is Pieak Pipattanaphon, who’s also the founder of Golden Coins beer (and Golden Coins Taproom in Ekkamai). We recommend the Golden Coins Happy Stout, which uses chestnuts for a smooth and smoky flavor. Lovers of tropical IPAs go for the Hop Hog Handsome Hog. Sixteen rotating taps store both Thai and international craft beers at this Silom shop-house, including the must-try Devanom (brewed by the Ungsriwong brothers who also own Thailand’s first ever hops farm). Burgers, barbecue and bar grub fill the menu, as designed by the CIA grad owners. Don't miss the American burger, a thick brioche bun with a juicy freshly-ground 150g patty, cheddar cheese and crispy bacon. Even in an age when every ‘hood in town boasts its own tap room, few can compete with the lineup of 30 brews from Denmark and beyond at Ekkamai’s Mikkeller outpost. Bonus points for the huge front lawn (barbecue time!) and quiet neighborhood setting. 26 Ekkamai Soi 10, 02-381-9891. Open daily 5pm-midnight. This is not just another typical craft beer joint. Not only does it aim to support the local craft beer scene, it is also part of the wider project Mitr Craft—Thailand’s first legal craft beer brewery—which seeks to improve the country’s economy. The project welcomes anyone to pitch their project on the website (www.mitrcraft.com) and if it gets 300 likes, it will get brewed at Mitr Craft and sold at Mitr Bar, with profits split between brewer and brewery. 3/F, 23/1 Phaya Thai Rd., 089-799-1123. Open daily 5pm-midnight. Situated on Ari Soi 1, this is not your average Irish bar. The decor is rustic enough, with a few industrial twists in the form of nicely-designed steel and wood table sets, but the beer selection is quite possibly the best this side of town. Highlight bottles including Mikkeller’s Not Just Another Wit and Hoppy Joe amber ale. All dark woods, vintage signage and spare lighting, this Chinatown beer bar swings to the sounds of upbeat piano jazz while pouring craft beers like Los Locos Mexican lager and Tuatara Weiz Guy Hefeweizen at some of the best prices in town. In the fridge you'll find beers from the top local craft brewers like Happy New Beer. Line your stomach with Chinese cold-cut platters, Sichuan chicken knuckles and dried goat meat. Squeezed between a motorbike repair shop and a spirit house shop, this is Yaowarat's latest bar to go for a red-lit, retro Chinese look. Rabbit Hill celebrates Asian drinking culture by offering beer, whiskey, sake and other booze from around the region. 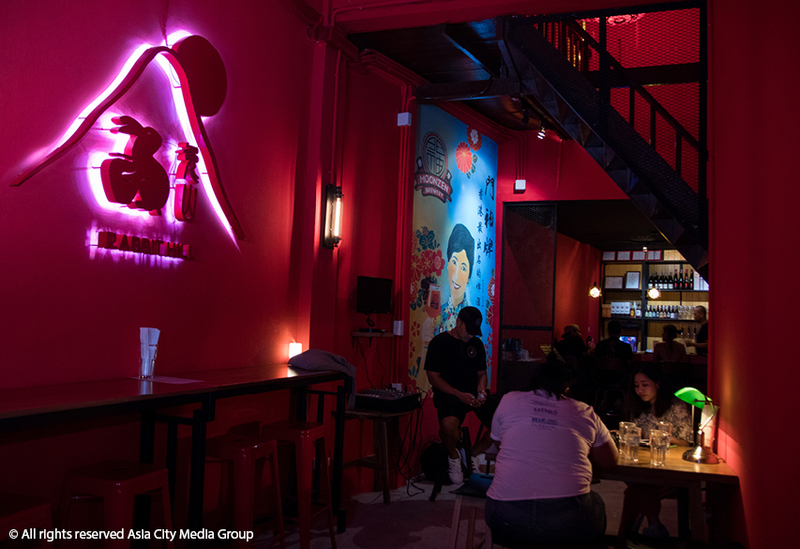 Step inside and things get a lot more kitschy with bright red walls and a striking mural of a qipao-clad woman drinking Moonzen, a Hong Kong craft beer—try the South Cloud Lager, a session beer with subtle Chinese tea notes. 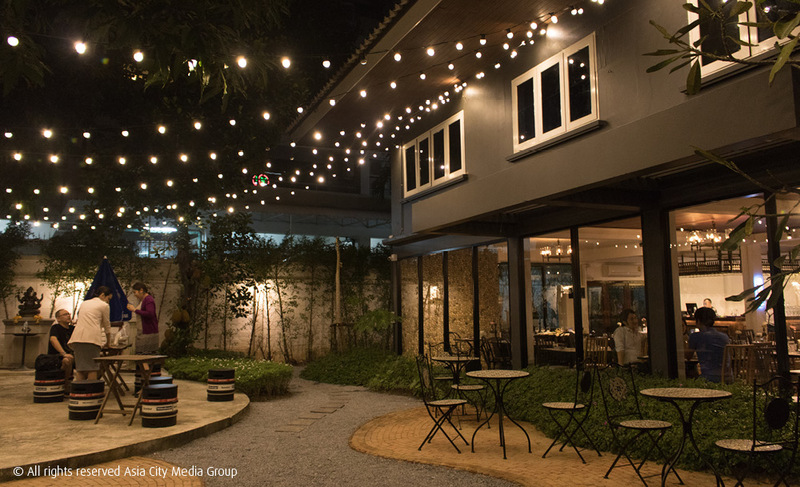 With links to Bavaria’s Schneider Weisse brewing company, this bar is set in a spacious house hidden in Ari Soi 4 that comes with a nice garden, perfect for the rare cooler months. Pretend it’s properly cold out with a heartwarming bowl of German venison stew and a big glass of the eponymous beer. Located amid the greenery of Sukhumvit Soi 26, Taproom's selling point comes in the form of 26 rotating taps pouring premium brews from around the world. That means names like BrewDog, Stone, Coronado, Bear Republic, Hitachino, Flying Dog, EvilTwin, Heretic and Speakeasy. Every time a keg finishes (almost everyday), you can expect something new to be hooked up to the tap. The environment is friendly, weekdays see live acoustic bands take the stage, and come the weekend the place kicks into party atmosphere with DJs. There's another branch in Ari, too. This oddly named bar brings craft brews to the trending streets of Ladphrao. Where Do We Go is a tiny, loft-style bare cement room that’s decked out with huge wooden furniture and hanging bulbs. Four taps are available here and beers rotate after each barrel runs out, so check their Facebook page or chalkboard on every visit. On our last visit, they had Sandport Summer Pine and Happy New Beer Thai Wit on the taps. On Nut’s homely two-story bar, Where Is My Beer? takes Bangkok’s craft beer obsession to new heights with what it calls “beertails.” The people behind local microbrewer Ladybrau whip out creations like the Dirty Flower, which adds gin, elderflower and lemon to their own Hefeweizen brew, and El Mexicano, a mix of lager, tequila, lime and mint. Not convinced? You can always stick to Zwickel and Das Weizen on tap. Add in German-inspired nibbles like cold cuts and pickles and beer-fried chicken. This giant warehouse serves a dual purpose as its owners online beer delivery website, leaving the gym-like space in the middle as a bar. With its scuffed flooring and furniture strewn about the place, the venue is as easygoing as they come, and the selection of brews is vast. Whether by bottle or draft, enjoy trending beer labels like Brewdog, Bavaria, Evil Twin, Chouffe and Vedett with a regular crowd of local hops enthusiasts. There's another branch across the river.